Palmistry shows how much passion in your hands. What Palm Reading Secrets Do Your Hands Reveal? Extra full mound with lots of thick soft but firm flesh bulging up reveals "passion below"! The firmer, the better (but not hard). Thin and flabby indicates disappointments ahead from poor physical endurance. A healthy color, with many vertical lines toward the fingers, will please the partner with much love and compassion expressed freely. This is also a sure indicator of a good nurturing parent and helpful, thoughtful, and kind mate. Decisions will be made in the heart and sentimentality may rule over logic but the intentions are good. Kind words, a soft gentle voice, expressing personal emotional feelings, and plenty of touching all over the body opens the door to this person's spirit, mind, and full body energy. Little finger straight, long, and leaning out to the side away from the ring finger reveals a "free thinker" not bound by conformity and the restrictive values of others. New exciting ideas and behavior are normal for this person's quick sharp mind. She or he needs mental stimulation and loves fun both mentally and physically. Willing to take a risk if the payoff looks good. A hint to guys: If she is wearing a delicate ring on the little finger, you better get ready for some hot action! A hint to women: Go buy a nice pinky ring if you want more action! A hint to all: A big heavy gold ring on a man's little finger reveals money is used for a feeling of power in place of weak sexual energy. Heart line long and curvy, ending near Jupiter (index finger). This indicates a tendency to release all emotions and passion that are normally blocked by the "head". This person has a philosophy: "Don't think about it. If it feels good, then do it and enjoy it now!" This person will be dedicated to pleasing the partner first. Emotions run the full range rapidly and frequently. Nothing will be dull with this person! The more curvy the heart line is, the more emotional and expressive the person is. The flatter and shorter the heart line is, the more stimulation required to get in the mood (except for men!). The heart line is one of the best indicators for compatibility and good mate selection. Certain heart line types work especially well together, and others are "double trouble". See "what your Heart Line reveals" for best mate selection using the six Heart Line types not shown here. Palm readers watch for this: Lower zone (of the three zones in each finger) much larger, much fuller, and much "plumper" proportionally than the other two zones above it. This indicates a very physically aware person who thrives on touching and especially enjoys the body's sensual pleasures. Luxury and the comfort of physical things are life's purpose. Pleasuring the body by both giving and receiving physical pleasure is a primary need. Food and hot sweaty activities, like a hot bath or sauna, are a great "turn on". Especially important is the lower zone on the little finger. 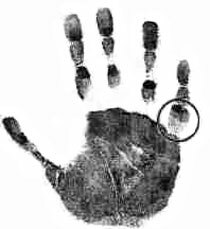 This area of the hand is one of the most revealing about sexuality. When this zone is extra large and extremely plump it indicates overflowing passion! Any vertical lines on this zone show a supercharged nervous system wired and ready for action. Any horizontal lines in this zone (or thin lower zone) indicate that the brakes are on in such matters as physical passion. Since coloring is different in different races, a "healthy" color is that of a happy, healthy child's cheeks in that race. Watch out for blueness; that is sadness and depression. Bright red is anger held inside, which sometimes can be released through passion. Sweating (when making love) is a release of hormones that stimulate the partner and is a definite signal to watch for that says, "I want more of this!" See our interesting website on relationship research. We have developed an additional website with fascinating relationship study findings. They may help you to better understand why and how you pick certain types of mates.